Trains have always fascinated many. Runaway cabooses, passenger cars filled with drowsy diners, or boxcars brimming with wild hobos, transporting all far off to fragrant destinations. Yes, there’s something mysterious about a good train ride. 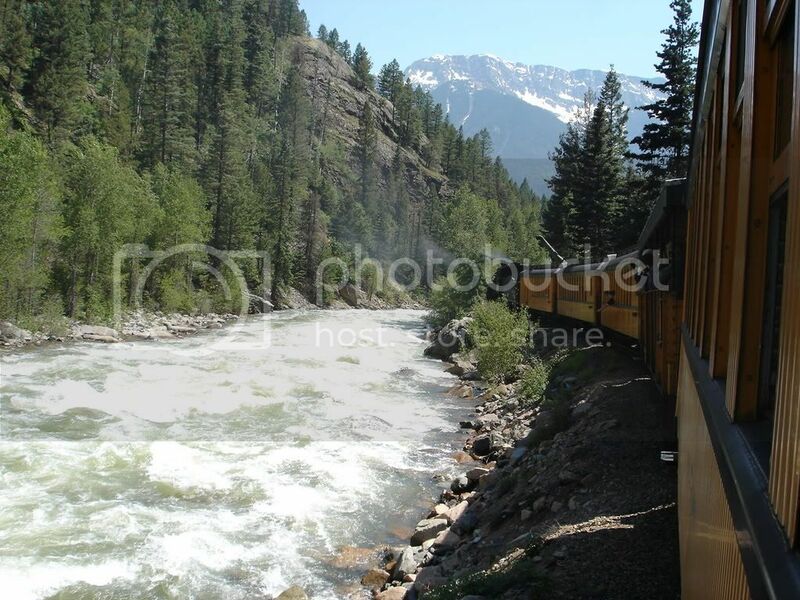 A few years ago, we took the famous Colorado Narrow Gauge Railroad excursion from Durango to Silverton-fifty-two miles of the San Juan scenic byway. The choices varied on how classed up you wanted to ride, but being the hillbillies we are, we chose the cheapest way, standard class, open air gondola seating. We didn’t want to miss an ounce of scenery and certainly weren’t disappointed with that choice. I can’t say I’ve ever seen such excitement in the eyes of my children. It seems everyone relishes a good train ride. We hung our faces out open air windows and drank in wind and wild. The train whistle would bellow, black smoke blow, and the tracks twist and turn around yet another mountain, where aspen trees shimmered and rusty colored beavers flapped and swam under leafy forests without footprints of modern life. That day we walked away with soot on our faces but pure nature tattooed on our hearts. To remember this trip,I bought a splendid watercolor of Durango Station, Engine 473, painted in watercolor by Russell Steel. Appropriate name, don’t you think? I had it framed and it now sits on the mantel, a memory of us, once upon a time, on a Colorado train. If you’re ever in that area, please don’t miss this exquisite experience. Recently, I saw a program discussing The Chocolate Train. Please get me on that train! My mouth perked at the mention of chocolate, so I had to watch. Would you like a little chocolate with your train? Switzerland is well loved for its scenery and chocolate. Throw in a train and you’ve got a first class experience called the Swiss Chocolate Train, which operates from June to October out of Montreux. Running on the Montreux-Oberland-Bernois Railway, this train takes you on breathtaking views of the Swiss countryside, rolling through the medieval town of Gruyeres, also known for their fabulous cheese making. In Gruyeres, the train stops for an excursion by bus to a local castle. Sound good so far? You’ll also get to experience a cheese factory. On board the train once again, you’ll head to Broc. The Nestle Chocolate factory is there. You can watch the production of chocolate and sample the goodies. Then buy all you want. 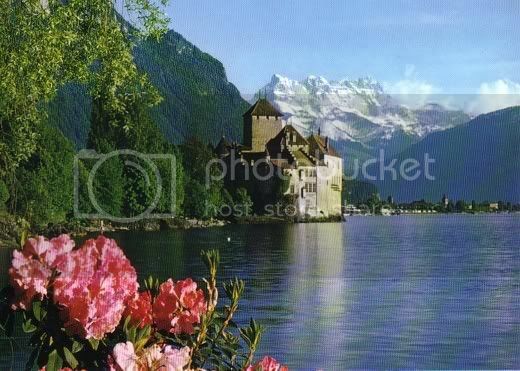 Nine hours later you arrive in Montreux, a sleepy resort town on Lac Leman and home to the Castle of Chillon. Now how’s that for a train ride, eh? Let’s go, shall we? All aboard! Good to see you around, Stephen! Not my pic, except for the painting. That trip was a few years ago and those pictures are around somewhere. You know. Ive been to Bern and i missed THIS?!? good lord....Im goin' back..see 'ya later! It's an exquisite area for sure. I hope you get to take that train next time. Well worth it! That brought back memories. I love the San Juans, Silverton, Ouray, Durango. I've driven through, but never took the train. And CHOCOLATE train...mmmm,,,,dare I say "Sweet!" Thanks for reading, Susie and Lillian! You got it, Sherry! I'll even throw in the chocolate. I hope you do hop on that train. Would love to hear about your adventures! Sign me up for the Chocolate train. Sounds like heaven. Actually I have been thinking about taking a train out wet and doing side trips! love this, dorraine! i , too, love a good train. my biggest hope is that we could develop all kinds of new trains for this beautiful country of ours. some super speedy. some luxurious for experiencing all the little towns slowly. our current system leaves so much to be desired . and we could get rid of so much of the jet fuel doing this. great job and glad to have you writing here!!!! xxxxxx!